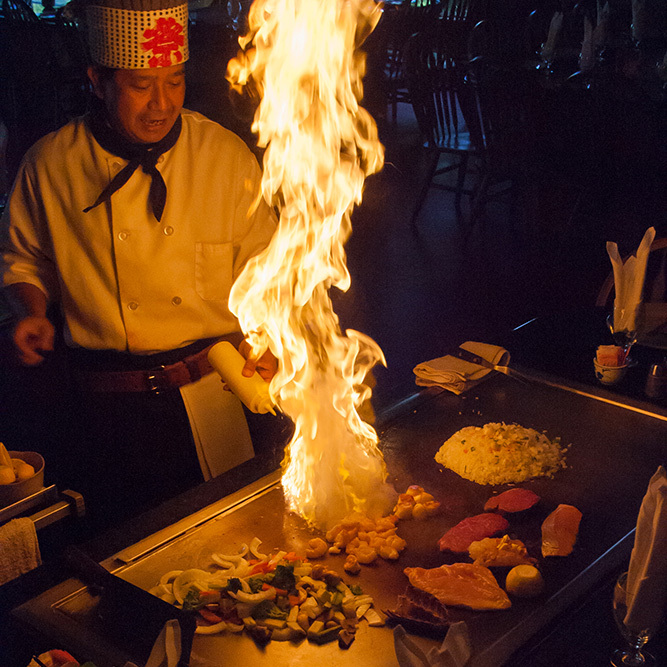 Nearly a century ago, the Hibachi Grill originated from OSAKA, JAPAN, KOBE’s neighboring city. In the early 1900’s, the grill was used to make Osaka’s dish, Okonomi Yaki (Japanese pancake with meat, vegetables, and seafood). Presently in Japan, the Hibachi Grill is used to make Okonami Yaki, skewered meats, steaks, and others. From Japan, the founder of Benihana restaurants, Rocky Aoki reformed Teppan Yaki to Hibachi in the early 1970’s. This display of Americanization is the simple combination of the chef’s skills, guests’ amusement, and great taste. After selecting and ordering your entree, you will be served our House Salad and Soup. Once the grill has reached the proper temperature, the chef will arrive and serve you two sauces: Kobe and Ginger. Both sauces are recommended with your fried rice, vegetables, seafood, and meats. The chef will begin by cooking and serving the vegetables (Spanish onions, zucchini, carrots, and broccoli) and fried rice (if ordered). The chef will catch your attention with our delicious shrimp appetizer. With your entree, the chef will ask for your preference in taste if applicable. With a limited amount of seasoning, the chef will use his culinary skills and talents to make your meal most enjoyable. *We will charge $2.00 per individual for the division of one entrée. *A gratuity charge may apply to parties of 8 or more. *Our kids’ meals are for children 10 years old and younger. Choose between chicken, pork, salmon, steak, tofu, and vegetables. If you choose from one of our premium options below, add to this base price.